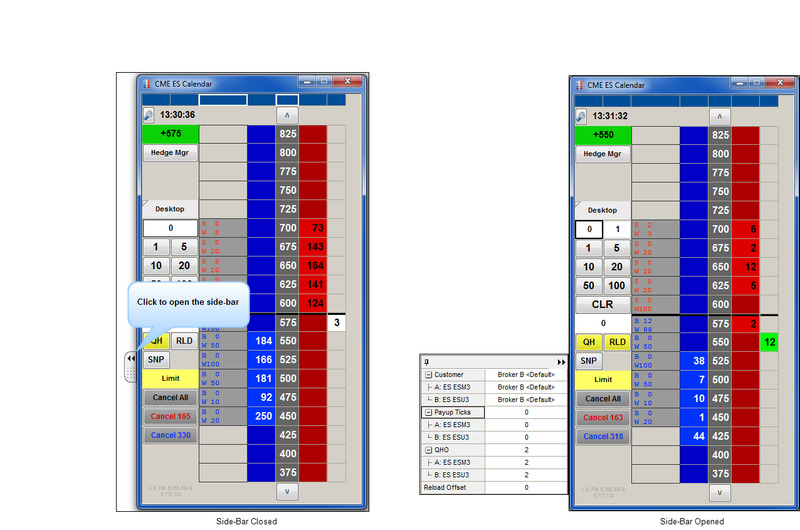 The Autospreader MD Trader Spread Pane includes a side-bar that allows you to modify your spread all in one location. 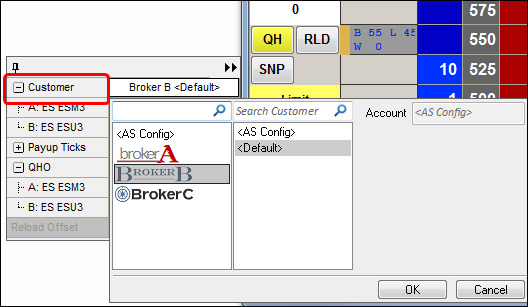 It also allows you to open the Routing Configuration Dialog box to select a broker and customer (X_TRADER ASP environment) or just pre-allocate a customer account (non-X_TRADER ASP) when submitting orders. To open the side-bar, click the side-bar tab in the Spread Pane. Using the side-bar, you can select or change which broker or customer account to use for submitting the spread or one of the legs. Click the side-bar in the Spread Pane. 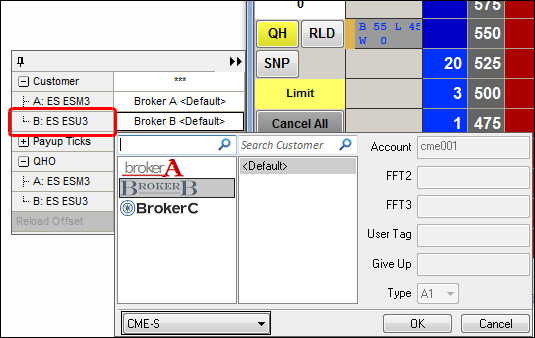 To select a broker for the spread, click the drop-down arrow in the Customer field of the Routing Configuration dialog box. If selecting a different broker for one of the legs, the customer account or any additional order routing or clearing information (i.e. FFT2, FFT3) is displayed for that leg. Select a customer from the list displayed in the Customer section. Select an order gateway (e.g., CME) if multiple gateways are available. 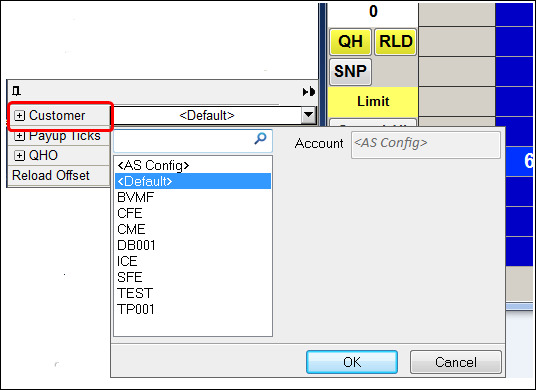 To select an account for the spread, click the drop-down arrow in the Customer field of the Routing Configuration dialog box. To select an account for legs of the spread, click the drop-down arrow in the leg field (e.g., B: FESX Sep). Select an order gateway (if multiple gateways are available) and customer account. When selecting a different account for one of the legs, any additional order routing or clearing information (i.e. FFT2, FFT3) is displayed for that leg. Enable payup ticks on the spread or an individual leg of the spread. Refer to Using Payup Ticks. 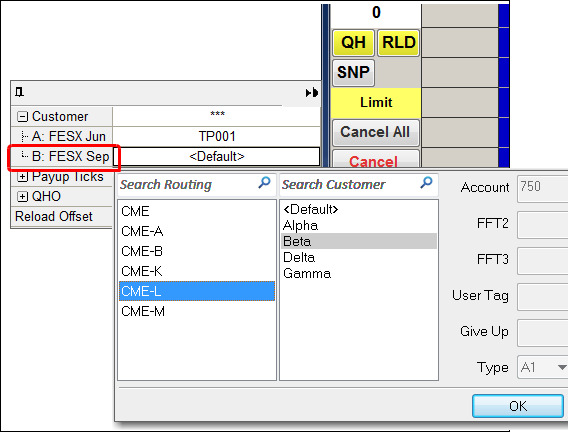 Configure your offset ticks for Reload orders. Refer to Using Reload Orders. Display and configure your Queue Holder (QHO) values. Refer to Using Queue Holder.